As a Sexual Predator (Florida Statute 775.21) or Sexual Offender (Florida Statute 943.0435, 944.607 or 985.481) where "Permanent residence" means a place where the person abides, lodges, or resides for 5 or more consecutive days, and "Temporary residence" means a place where the person abides, lodges, or resides for a period of 5 or more days in the aggregate during any calendar year and which is not the person's permanent address; or, for a person whose permanent residence is not in this state, a place where the person is employed, practices a vocation, or is enrolled as a student for any period of time in this state, I understand that I am required by law to abide by the following: FAILURE TO COMPLY WITH ANY OF THE FOLLOWING REQUIREMENTS IS A FELONY OF THE THIRD DEGREE (UNLESS OTHERWISE NOTED). 1. 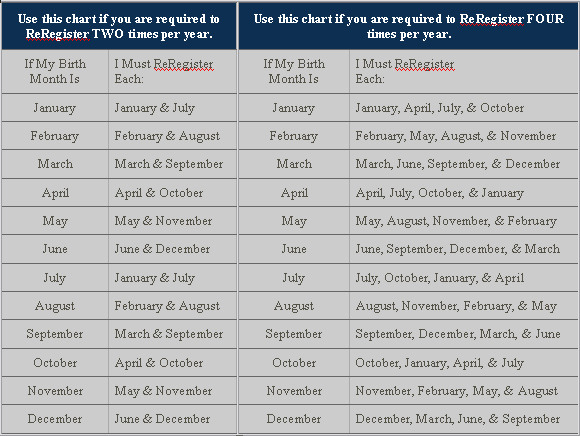 I must report in person to the local Sheriff's Office within 48 hours of establishing or reestablishing a residence in the state of Florida or within 48 hours of release from custody and/or supervision of Department of Corrections (DOC), Department of Children and Family Services (DCFS), or Department of Juvenile Justice (DJJ) to register my temporary or permanent address. 2. Within 48 hours after the initial report required as stated in requirement #1 above, I must report in person to the driver's license office of the Department of Highway Safety and Motor Vehicles (DHSMV) to obtain a valid Florida driver's license or identification card displaying one of the following designations: "775.21, F.S." or " 943.0435, F.S. ", unless a driver's license or identification card with such designation was previously secured or updated while under the supervision of DOC, DCFS or DJJ and there have been no changes to my address, name or designation (Florida Statute 322.212). 3. I must report in person either twice a year (during the month of my birth and during the sixth month following my birth month) or four times per year (once during the month of my birth and every 3rd month thereafter), depending upon my offense/designation, to the Sheriff's Office in the county in which I reside or am otherwise located to reregister. NOTE: Unless otherwise notified by the Florida Department of Law Enforcement (FDLE), Sexual Offenders that were not adjudicated delinquent are required to ReRegister twice a year. All Sexual Predators are required to ReRegister four times a year and all Sexual Offenders adjudicated delinquent are required to ReRegister four times a year. 4. Within 48 hours, after any change of address in permanent or temporary residence, change of name due to marriage or other legal process, or when my driver's license is subject to renewal, I must report that information in person to the driver's license office of the DHSMV to obtain and maintain a valid Florida driver's license or identification card. 5. 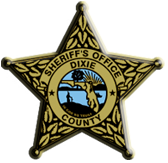 If I live in another state, but work or attend school in Florida, I MUST register my work or school address as a temporary address within 48 hours by reporting in person to the local Sheriff's Office. I must also obtain and maintain a valid Florida driver's license or identification card. 6. If I intend to establish residence in another state or jurisdiction other than the State of Florida, I must report in person to the local Sheriff's Office to notify of my intention to do so within 48 hours prior to leaving. 7. If I later decide to remain in this state (see #6 above), I must report in person back to the local Sheriff's Office to notify of my intention to remain in Florida. This report must occur within 48 hours after the date I indicated that I would leave. Failure to comply with this requirement is a felony of the second degree. 8. If I move from a permanent residence and do not have another permanent or temporary residence I must report this change in person to the Sheriff's Office within 48 hours. I must update all registration information and provide an address or location that I will occupy until I establish a residence. 9. If I later decide to remain at the permanent residence (see #8 above), I must report in person back to the Sheriff's Office to notify of my intention. This report must occur within 48 hours after the date that I indicated that I would leave the permanent residence. Failure to comply with this requirement is a felony of the second degree. 10. I MUST respond to any address verification correspondence from FDLE within three weeks of the date of the correspondence. 11. If I am employed, carry on a vocation, am a student, or become a resident of another state I must also register in that state. 12. If I am enrolled, employed, or carrying on a vocation at an institution of higher education in this state, I shall also provide the name, address, and county of each institution, including each campus attended, and my enrollment or employment status. I shall report each change in enrollment or employment status in person at the Sheriff's Office with 48 hours after any change in status. 13. I MUST report any electronic mail address or instant message name, prior to using such, during Registration/ReRegistration and provide all updates through the online system provided by the Florida Department of Law Enforcement. This provision takes effect October 1, 2007.